Free demo account whith 10000$. Website appears clean and professional. With advancements in financial products and platforms, the retail investor has access to markets that normally have been for those with large trading accounts. Through products such as binary options, it offers an attractive alternative to those looking to gain exposure without requiring large upfront capital requirements. ExpertOption is a digital options platform that allows individuals to trade products derived from underlying assets. The most desired assets are present such as indices, commodities, and Forex pairs. Using digital options or binary options are a way to gain exposure without taking on large amounts of risk compared. One item right off the bat is their website does not do a good job at indicating how the company works. Sure, it states that they are a digital options platform but beyond that everything appears vague and difficult to navigate. Regardless, how ExpertOption works is you simply select what you want to trade. Whether it’s Forex or indices, you then decide on the direction of the market and place your trade. There are many countries that are unable to utilize ExpertOption and those include individuals located in the United States, Canada, and the European Union. You can find the full list of countries at the bottom of their about page. Overall, at the start their website appears clean and professional. Modern look with all the important links on the first page, but let us dive a little deeper and see what Expert Option offers their clients. Without testing the platform for a length of time, it’s difficult to fully understand if the platform is reliable. However, you can begin looking at different parts of the company to see if there is a level of reliability. According to their website, the company was founded in 2014 and have over 8 million opened accounts. Their values include clients, simplicity, speed, and reliability. Under the reliability title, the company goes on to state, “Being an industry leader we provide our clients with extra solidity. We are doing more than anyone else to satisfy the needs of our clients”. This certainly is a positive sign for those looking to ensure reliability is at the company’s forefront. From there, we can derive that ExpertOption is an authorized and regulated company under the VFSC Government Finance Commission. Further more, they state their activity is approved and supervised by FMRRC organization. Lastly, which would seem standard are the security standards and accurate quotes. Overall, the first glance test appears they are reliable but that is only the surface. With any trading platform it is critical to have a demo account for those who are either new to trading or want to test strategies utilizing your platform. 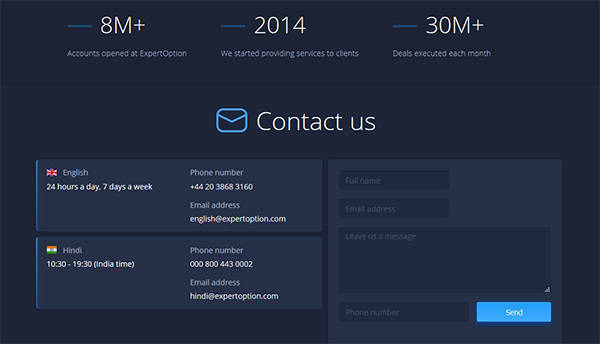 ExpertOption is no different and they offer a demo account for the current and potential clients. It would be wise to open a demo account before depositing money so you can have a feeling for how the platform works. The demo account is very clean and it appears to give traders the ability to test drive everything they would have access to in the live account. You are given $10,000 virtual dollars to test the platform with. From there, you can change the charting format to fit your needs. Whether it is the addition of moving averages or updating the candlestick patters, you can make it very much as you wish. However, if you are looking for a more in depth chart you may want to look at other charting platforms or software. Keep in mind though you will want to ensure the underlying asset is being priced correctly as the price may be off slightly and that can cost you should you be trading with fractional movements. Overall, the demo account seems reliable and if the live account is anything like the demo then you are in good shape. When searching for the right place to begin your trading it is important to review the different types of account. ExpertOption has several different account options, which appear to be more than many other platforms out there. Let us start from the lowest and work our way to the most expensive option. First there is the Basic account, which requires an opening amount starting from $50. This account is described for someone who is looking for a light start, but has the ability to upgrade later should they choose. 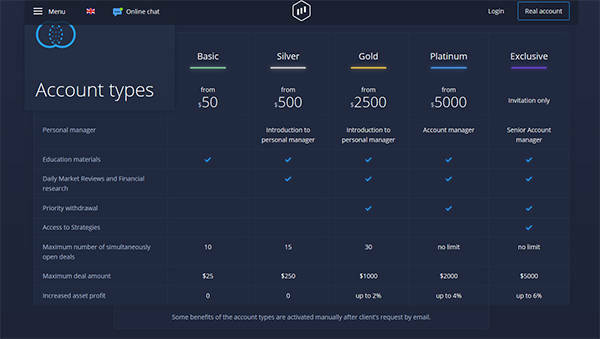 From there, you can choose the Silver account and that requires a starting balance of $500 or more. ExpertOption states that a majority of their clients start at this tier and with this tier includes a free consultation. In the middle of the account selections is the Gold account. Starting with a deposit of $2,500, Expert Options states, “Smart investments start with Gold account”. Should you sign up for the Gold account, you will enjoy “privileged features”. The most expensive option for those looking to fully commit is the Platinum tier. To obtain this, you need a deposit starting at $5,000. With this comes ExperOption’s best expertise and exclusive account management for the most serious investor. There is an Exclusive account option, however, this appears to be by invitation only and you have to ask your account manager for additional details. Should you feel this is the best fit for you, you can look to really upgrade your account. However, ensure the account you choose is the best utilization of your dollars. A unique feature that ExpertOption appears to have that other platforms do not is Social Trading. Social Trading allows you to view others trades in real time. You can trade with your friends or begin following an individual you find that fits your trading style. Another item that comes along with Social Trading is a leader board where you can see how you stack up against more of the seasoned veterans. This is a unique feature that not many platforms have and can be used as a way to engage with other traders. Utilizing this may not be for everyone, but it is something that is more one of a kind than others can say. If you want to see how it works, the demo account has the feature in use. One of the drawdowns is it can distract from the overall charting experience, but others of you may disagree. When choosing any platform, one of the most important features besides a platform that works well is the mobile platform. With markets constantly moving, it is important that traders have access to execute trades should news come out or are simply away from their computer. Expert Option has an application for both major operating systems, allowing you access to your account. According to their website, ExpertOption is a top finance app in 47 countries and currently has over one million installs. You also have the ability to download desktop applications, which can be handy if you prefer a non-web browser feel. As with any trading platform, it is critical that you have access to your funds with reliability, certainty, and speed. On the FAQ page of the website, the minimum deposit is $50, which will allow you to achieve the basic trading account. Minimum trading amount is $1 and the minimum withdrawal amount is $10. The length of time it takes to withdraw funds is 2 working days, which isn’t terrible compared to other platforms. ExpertOption takes several different deposit methods and they include Visa, MasterCard, Maestro, UnionPay, Neteller, Skrill, Perfect Money, FasaPay, and others. Also, ExperOptio states that Gold, Platinum, and Exclusive account have priority withdrawal. Lastly, many of the trading platforms out there have educational opportunities on their websites, and ExpertOptions is no different. On their education section, they have it broken down to trading strategies, technical analysis, graphical analysis, fundamentals analysis, and psychology of trading. This is quite an extensive list as many platforms only have one or two topics in their education section. The trading strategies include candlestick patterns and trend strategies. Some of the technical analysis includes trend support and moving averages. From there, the rest are fairly self-explanatory, but it is nice that they provide traders with several different options to learn and grow. Overall, ExpertOption.com provides traders with a very professional feel and platform. When you first log in, all of the important buttons and links are on the first page. One thing that stood out was the demo account seemed to be very easy to test and explore. Very customizable, it allows you to take a quick look under the hood before opening a live account. Also, the education section is one of the more robust ones out there in terms of topics. As far as details and value, that will differ from trader to trader. However, one of the drawdowns are they are not very public with the different assets you can trade such as Forex and commodities, which should be easy to find. Also, they have a few regulation certificates but they appears to be less official than some of the more well known ones out there. These can make anyone who is new to the platform a bit nervous. After all is said and done, this could be a solid platform if it fits your need. Ensure you test drive the platform first before risking your hard earned capital. From there, understand which account fits you best so you are not wasting money on unnecessary tools and products. See ExpertOption for yourself, you may find this to be the right fit for you.